No Uber, Drivers Log-OFF strike! Monday 6/8/2018 – 7am to 9:30am. Boom. The RSDU are announcing a national Uber drivers’ LOG-OFF strike, Monday 6 August 2018 – 7:00 am to 9:30 am in Melbourne, Sydney, Brisbane and Perth. This following Uber’s introduction of “upfront fares” and UberPool, both features designed to further shortchange and underpay drivers, eroding even more their already poor working conditions, all under a false “independent contractors” pretence. We are calling on all drivers to switch OFF their Uber driver app and refrain from taking Uber bookings between the hours of 7:00am until 9:30am on that day (Monday 6 August 2018 ). Drivers are encouraged to continue taking bookings from all other rideshare operators during the time of the strike. Uber must stop using “upfront pricing” and revert back to a transparent system where drivers are paid by the actual time and distance traveled, just like before. Taking into account unexpected traffic conditions, passenger requested stops, and/or occasional road closures.Uber should also treat its “independent contracted partners” accordingly and advise drivers of the destination before they start the trip. Uber must provide drivers with an option to opt-out of the UberPool service without penalties. Drivers who choose to take UberPool rides should be better compensated and not the other way around. They should be paid the equivalent of UberX base rates plus at least 20% more as they are required to pick up multiple passengers over multiple stops.We would also like to see Uber address the dangers involved to riders and drivers after instructed by the UberPool system (too often) to pick up multiple riders in illegal pickup zones. Uber must increase uberX base rates by at least 15% to account for the constant increase in car maintenance and on road costs to drivers. ↘ It’s official: Uber is in breach of contract with their driver “partners”. ↘ UberPool – a new layer of driver’s exploitation. Read this recent ABC special investigation into Upfront pricing and UberPool instigated by RSDU. Uber’s cynical exploitation of drivers is not new. The two latest additions, “upfront pricing” and UberPool take the problem to a whole new level. Forcing drivers to agree to unacceptable contract addendum terms and no way of opting-out without being deactivated. The question anyone must ask themselves is what our Government is doing about that? Especially the Government bodies like the FWC or ACCC, bodies supposedly responsible to ensure such mass scale exploitation of workers is not allowed in this country. The RSDU will continue to submit information to FWO in hope of a faster turnaround to this obviously burning matter. We have been advised the investigation into Uber is ongoing and we encourage all drivers involved and affected by upfront pricing to do the same, forward the information to your inspector(s) and seek answers. We are also calling on the public to support us in our fight for fair working conditions and to refrain from booking an Uber Monday 6/8/2018 – 7am till 9:30am. Shortchanged UberPool and “upfront pricing” trips are likely to be financed by your underpaid driver who in most cases take a major loss on such trips. Don’t let Uber do it to drivers just like you wouldn’t like it being done to you at your own place of work. Drivers please spread the news at every opportunity. We call on drivers to do their part and spread the news of this strike to other drivers they meet at popular gathering places like the Airport etc. Don’t forget to share this page on any social media platform you are a member of. Be the change you want to see and switch off your Uber driver app this coming Monday. Yes you are likely to see or hear about drivers who chose to do otherwise, maybe because they are new to Uber, or maybe because they did not hear about the strike or simply decided not to take part. Don’t let that influence your own decisions. Throughout history it is always the smaller groups, the pioneers who draw the line in the sand and took a stand, changing the reality and improving conditions for everyone else. Be proud of being part of this small special group! Switch Uber OFF Monday 6/8/2018 from 7:00 am until 9:30 am. ↘ Strike has successfully ended. Click here to visit the strike results page. Please vote in our polls: Voting is anonymous. 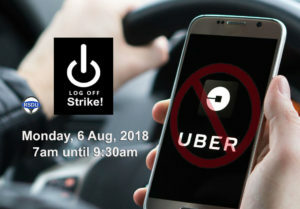 Are you taking part in the Uber Log-OFF strike Monday 6 Aug, 2018 7am - 9am? What do you think is the real status of an Uber Driver? Register with RSDU and stay informed. Its Free.